MacGregor Point Provincial Park is one of the most overlooked natural wonders along the Lake Huron shoreline. This forested provincial park offers the traveler many outdoor experiences to remember. MacGregor Point is part of a natural forested corridor that extends along over 7 miles Lake Huron shore. The Park consists of wetlands, former beach ridges, sand dunes and forest communities. It is a haven to over 105 migratory birds and has a varied forest and wetlands habitat. MacGregor Point Visitor Centre is open daily from May through September for a minimum of 4 hours per day. During July & August full programming is carried out. The park's visitor centre offers displays, brochures, a campers' library with field guides and nature lore and the Huron Fringe Shop operated by the Friends of MacGregor Point Park. Naturalist's programs, conducted walks and a variety of children's activities are offered regularly, providing visitors with excellent opportunities to learn first hand about the environment around them. 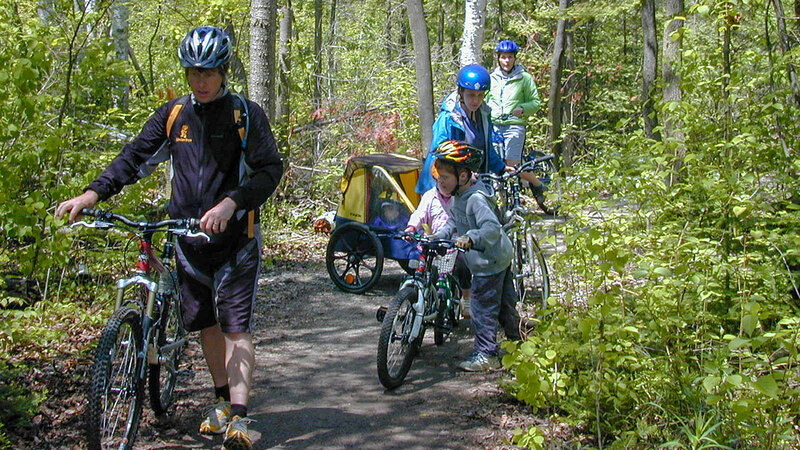 Located just north of Wiarton on Bruce Road 9, the Mountain Bike Adventure Park provides riders with over 15km of both double and single track trails. This property has seen many upgrades over the years, which includes 3.5 km gravel chariot loop. 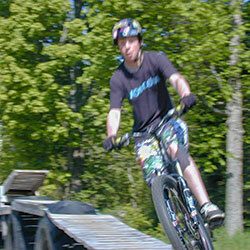 Local riders consider the MTB Park one of the most challenging trail properties within the County of Bruce. Families and beginner riders will enjoy the hard-packed aggregate trails such as Rocky Way and Albemarle Pass. If you are looking for more of a challenge hit up the Pine Loop and Rocky Flats. For the more advanced riders be sure to try Big Bear. It is fast, challenging ride with lots of rock outcrops to navigate. If you are up for a more serious workout, try Maple Ridge. The first Trail Crew was established in 2001 and since then, there have been over 100 individuals that have worked on the trails program. These workers have dedicated their time and effort into building new and exciting trail experiences for you! Wiarton is another sleepy little village located on the big water of the Georgian Bay. 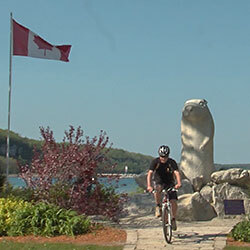 We made a stop at the famous statue of Wiarton Willie, Canada’s famous groundhog predictor of seasons. We toured along the water and discovered areas that I really never noticed by car but on a bike were given whole new perspective. 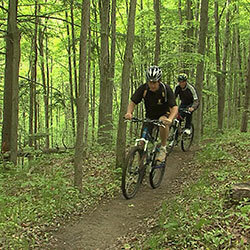 The Brant Tract contains 781-acres of mixed hardwoods and softwoods and contains approximately 30 kilometers of trail. These trails range from single-track, double-track to roadways suitable for all levels. The two road systems located on the property are the West Trail and the East Trail. The 20 kilometers of single-track wilderness trail can be accessed from either of the main road systems in the park. Picnic areas, benches, boardwalks and bridges can be found throughout the park. This is a multi-use trail system and it is quite common to encounter other users on double track such as equestrian. The quaint little town of Southampton is located on the Georgian Bay. Although the community still has its own post office, it became part of the municipality of Saugeen Shores in the 1990s. 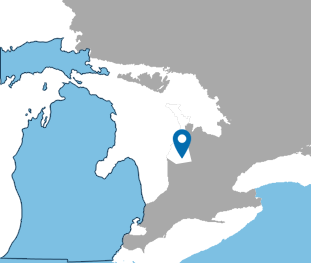 Saugeen Shores is made up of Southampton, Port Elgin, and the former Township of Saugeen. The community of Southampton continues to expand. 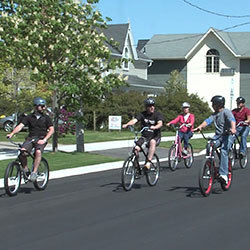 It has become a bedroom community and a retirement destination, as well as a tourist destination. 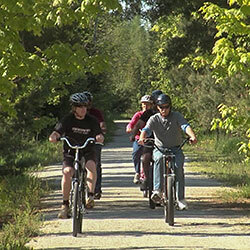 The Saugeen Rail Trail is a year round, multi-use trail that connects Southampton and Port Elgin, Ontario. Built on an old railway line the trail is easily accessed and used by visitors and residents alike. 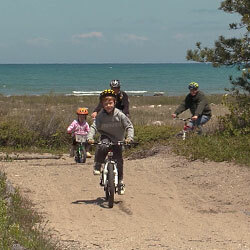 A popular trip is to travel the entire trail by bike from Port Elgin to Southampton and loop back along the scenic North Shore Road where beautiful views of Lake Huron can be experienced.